The previous retail version (6.3) of DTL OTMaster was released back in the spring of 2016. A lot of functionality has been added since, especially developed for the internal font production at URW Type Foundry and the Dutch Type Library. The current OTM version is already 7.9 and an overview of the extensive new functionality can be found below. The initial idea was that version 8 would be the next retail version. However, the conversion from OTF to TTF and vice versa, the handling of the UFO 3 format, and the development of the updated manual takes a bit longer than planned. Especially since the TYPO Labs conference in Berlin last April, we received quite a number of requests for a new OTM version. Therefore we have decided to release version 7.9 ﬁrst. Consequently this version comes without the OTF to TTF conversion, UFO 3 support, and without an updated manual. However, because of these limitations we lowered the price for OTM 7.9 to €199 instead of the standard €255: please note this is a one-time-only discount. Owners of version 7.9 will be able to upgrade to version 8 (scheduled for the ﬁrst half of 2019) for only €25. An upgrade from older versions, for example 6.3, to version 7.9 costs €50. OTM 7.9 is available for macOS, Windows, and Linux. The macOS version has not been notarized by Apple for Gatekeeper yet: consequently, when starting OTMaster for the ﬁrst time, the right-mouse button (or <cntrl> + click) has to be pressed to open the application. Of course, alternatively the settings for allowed downloaded apps in the ‘Security & Privacy’ section of the System Preferences can be changed. 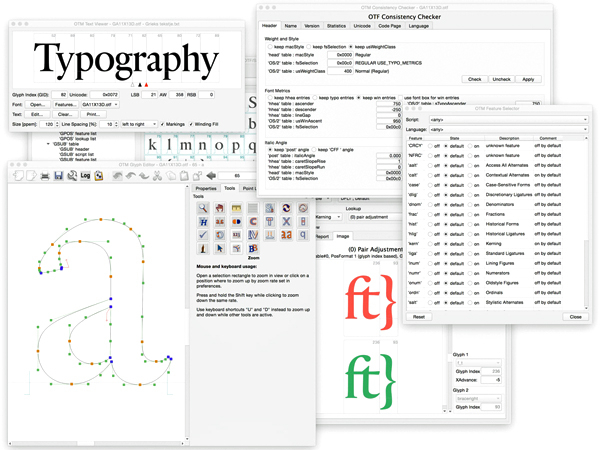 OTM 7.9 is available from Glyphs GmbH, FontLab Ltd., and DTL. Looking at yesterday’s sales I can happily conclude that there is a strong demand for a sophisticated post-production tool like DTL OTMaster still. Time is ﬂying and the ﬁrst edition of OTM was released already nine years ago. The tool is part of a much longer development, which started roughly 40 years ago with the IKARUS system at URW. Those who have visited the new https://www.fontmaster.nl website already, will have noticed that we made a brief start with describing this development, which is fun to do actually. 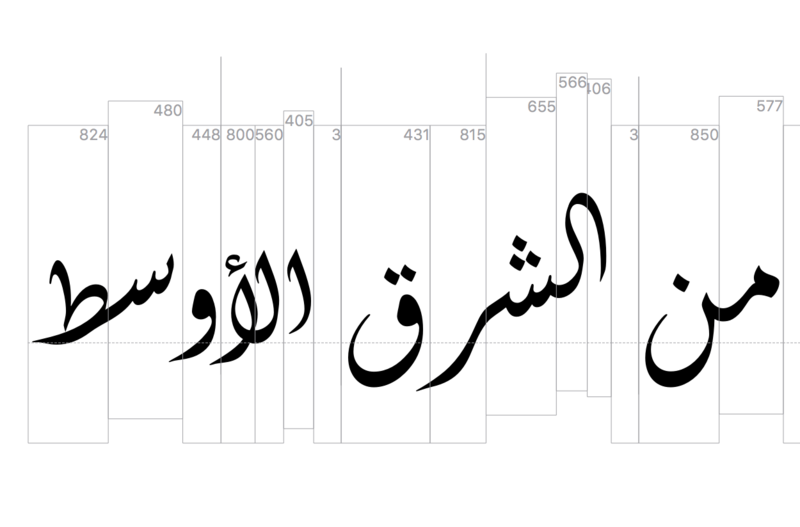 Does DTL OTMaster support Arabic including RTL kerning, swashing and across-up-down overlapping as elaborated in the attached QB-English.pdf? 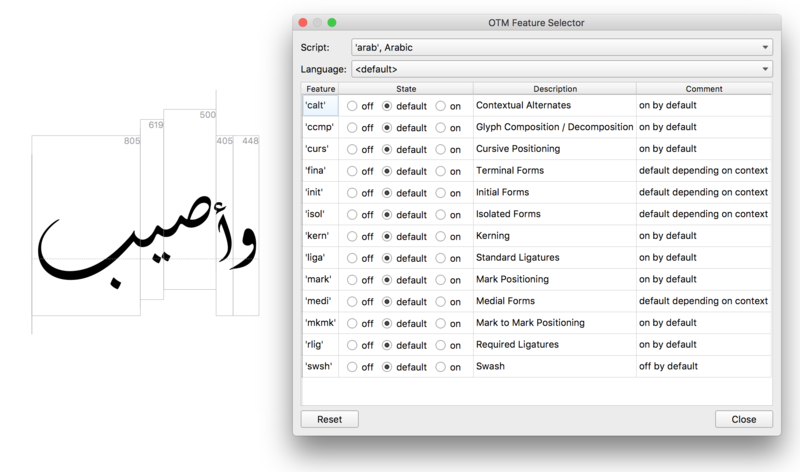 Although Arabic is not really my stronghold, OTM should support all of that, I reckon. However, if you would like to test this thoroughly yourself, please send me (otm[at]dtl.nl) your e-mail address and let me know whether you use macOS or Windows. Whatever the outcomes of your tests are, I would very much appreciate it if you post these here on TypeDrawers. • Sorry, no report available for GPOS lookup type 3. The 'kern' feature behaves well in all panels, but writing direction may need to be manually toggled for the left-to-right kerning of numerals. The Feature panel in the Text viewer is nicely designed for complex scripts that have default shaping features, in that you can toggle from the default state to check behaviour with and without features applied. Frank: the raising of the body rectangle is a nice visualisation of the cursive attachment positioning. I wonder if something similar could be available as an option for visualising horizontal positioning adustments in kerning. In this image, the first two glyphs on the right are kerned. It would be nice to have an option to display the kern as some form of overlap between the rectangles, e.g. a pale grey region. When will Fontlab be offering the upgrade? It would be nice to have an option to display the kern as some form of overlap between the rectangles, e.g. a pale grey region. I will discuss this with Juergen, but that should be doable for version 8, I reckon. Thanks for the posts and images, BTW! Yesterday I have sent OTM 7.9 to AzizMostafa for testing, and I am curious whether he will come up with some additional suggestions for improvements. Will Fontlab be offering the upgrade? The plan was that FL would offer OTM 7.9 this week also. Maybe Thomas can provide some additional information. I've made the payment for upgrading from 6.3 to 7.9 version but I've only receive link to download the 6.3 full version. We will have the 7.9 version available within the next day or two. Sami, thanks for upgrading OTM. Yesterday morning (our time) an e-mail containing the download link for version 7.9 was sent to the address specifed in your order. A few minutes ago we resent it with a different subject to prevent that it might end up in your spam folder. Thomas, good to know that FL will start delivering OTM 7.9 within a couple of days! This upgrade is Great, especially working with variable fonts! But 7.9 version still can't edit names in Character Variants features, this is very frustated for me. Please, if there is a way to edit the names in CVxx, I would like to know. Hi Sami, thanks for your compliments! Aren’t these entries just ‘normal’ ones in the name table that have a table index >255? The problem is I use microsoft VOLT and I never get to import the fea file. There is always an error. The name table is fine. I have no problem there. The problem is to link the CVxx tables with name table. You can enter in the entries of Stylist Set Fetures (Grow option) but not in the Character Variants features. The name table is not a problem. DTL OTMaster still is my best font software. The DTL team are great. 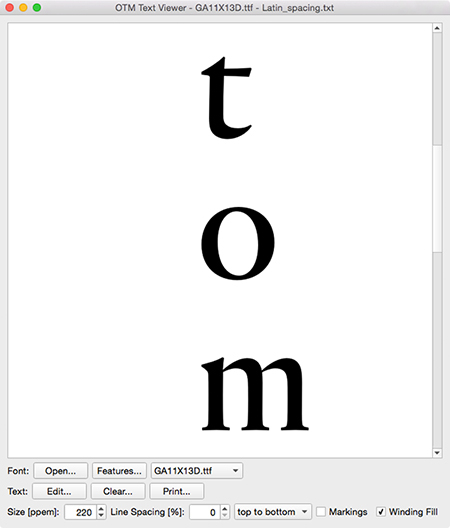 The main OTMaster page on FontLab still needs some work, we are actually replacing it with a new, more modern page. So does it fix the bug that in the text view the option "top to bottom" actually arranged text in bottom-to-top? Is there a way in OTM 7.9 to manually change the variation menu order for the variation instances?